It is cold and flu season, and all around you hear the sneezing, the hacking, the moaning of sufferers. But there are things you can do to keep from joining the ranks of the sick and miserable –- and there are things you can do to feel better if you get sick. Wash your hands after you shake hands with someone, after you touch something other people have touched, before you eat. In fact, wash your hands as often as possible, using soap and hot water. Don’t touch your eyes or nose, because those are places where germs can congregate. If you do, wash your hands. Get enough sleep –- at least eight to 10 hours a night. A lack of sleep makes you more susceptible to cold and flu germs. Get a flu shot. The earlier you get your shot the better, although when it comes to flu shots, it’s better late than never. Work out regularly; it strengthens your immunity. However, don’t work out if you think you are already sick. Keep away from people who seem sick. Keep alcohol-based sanitizing wipes or gel nearby, and use them liberally. You can use them on your hands if you can't wash with soap and water. And use them to wipe down things lots of people touch, such as phones, light switches, remote controls, etc. Quit smoking. And if you don’t smoke, stay away from people who do. Be careful what you eat at parties, in your office lunchroom or at home. If someone with a cold double-dips a chip or sticks a hand into a bowl of M&Ms, you could pick up their germs. In fact, it might be best to avoid communal foods altogether. Women, put away your cloth purse and use a leather or vinyl one that you can wipe down. Then do wipe it down. Don’t bite your nails, because germs collect there. Think positively and do things that make you feel happy, because happiness boosts your immune system. Sneeze into the crook of your elbow, not into your hands. Stay away from people; in fact, stay in bed if possible. You don’t want to spread your germs, and you want to give your body the rest it needs to recover. Keep an eye on your symptoms. 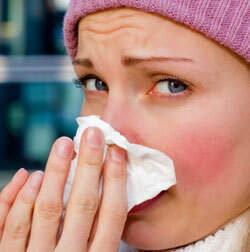 If you have congestion, a runny nose, a low-grade fever and/or a cough, you probably just have a cold. But if you start to have a higher fever, green mucus or a serious cough, it’s time to call the doctor. Drink plenty of fluids. A cold -- and especially a fever -- is dehydrating. Even if you don’t feel much like eating, make sure you get enough to drink. Don’t reuse tissue. You probably will just reinfect yourself. Make sure you have stockpiled several boxes of tissues before you get sick.